There are few things more sentimental than photos of those special moments in life. Even in the digital age, where thousands of photos can be taken and stored in seconds, there is still something so precious and significant about having prints in your home and office. Whereas taking photos has become as easy as pushing a button on your phone, choosing the right picture frames can remain a daunting task. Beyond the obvious requirements like size, shape, and orientation, there are the less obvious, more meaningful decisions to be made: the mood of the picture, the style of the frame, the color and quality of the wood, and more. 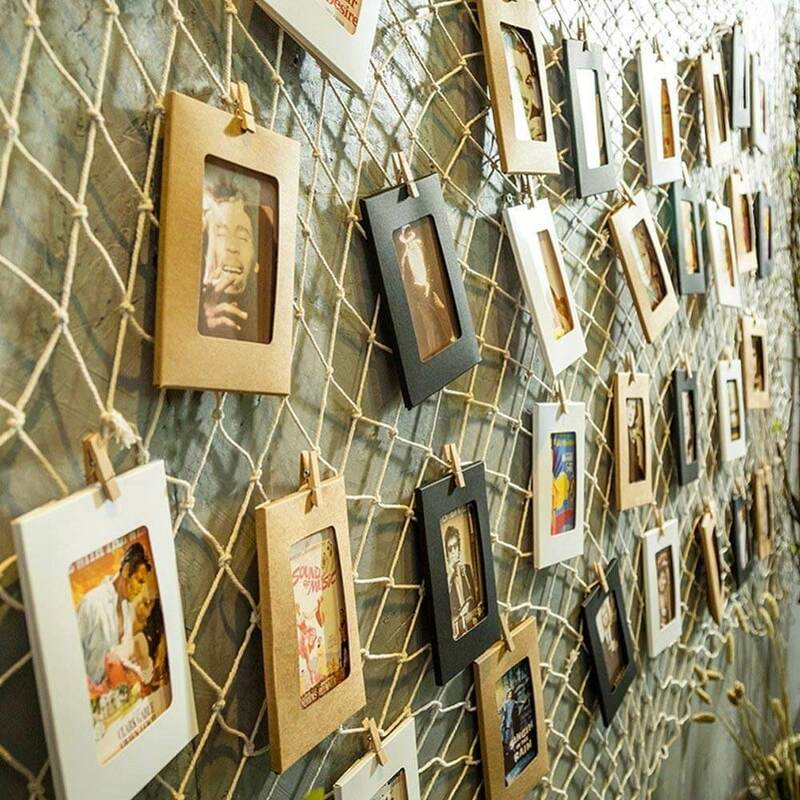 Use this list for some photo frame inspiration. Whether you are updating old cheap picture frames or want to display new images from you and your family’s life, these frame ideas are almost as fresh, lively, and beautiful as the pictures they’ll end up holding. As with any design choice, consider the context of your home or office before selecting the best frame. This list boasts it all, from sleek and modern to shabby chic. Whatever your aesthetic, choose a look that complements your favorite photos and your home’s theme, and enjoy reliving those precious moments. 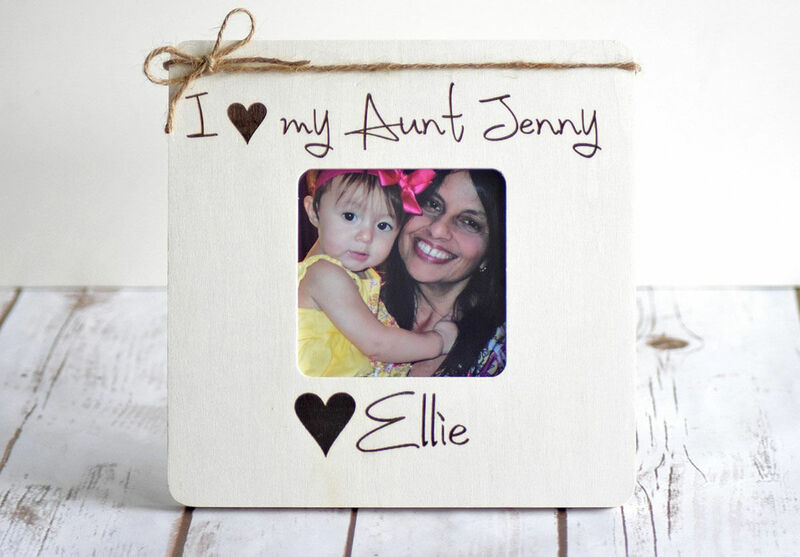 A unique and whimsical look, this frame has your picture printed right onto it. 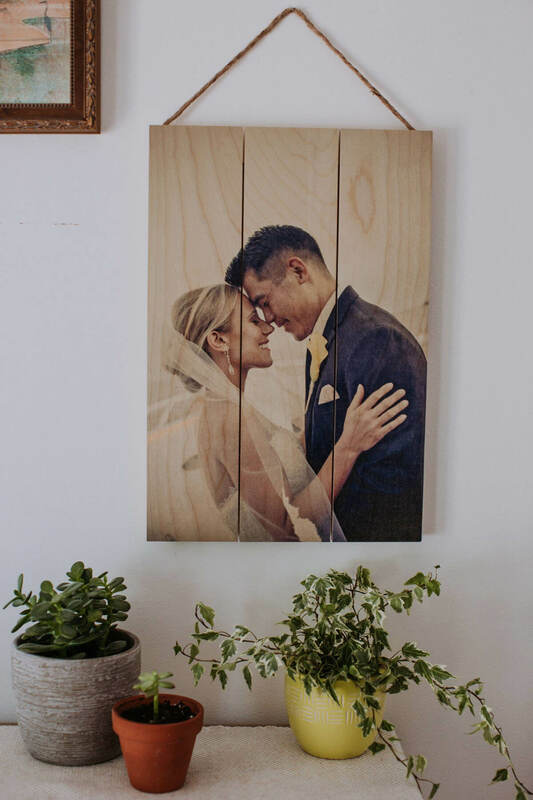 There is no need for borders, glass, or a matte when you can simply print your favorite photo right onto this light wood hanging wall piece. This approach is perfect for any photo that you want to display with a soft and natural look. Great for adding a bit of drama to a photo, these dark and slightly distressed frames work beautifully as a set or on their own. Pair these with black and white photos for an old-fashioned and weathered look, or use a colored photo to create contrast and brighten up the look. With alternating cross-cut grains on each side, this frame is interesting and simple all at once. Great for display on any table, the light color will not only make your photo pop but can be matched to nearly any décor. Give this fantastic frame as a gift, or set it up in your own home to permanently place your favorite memories on display. When selecting that special and sentimental photo for display, you want to be sure that your frame isn’t stealing the show. That is why this frame, with its simple white and clean fonts, is a perfect choice. 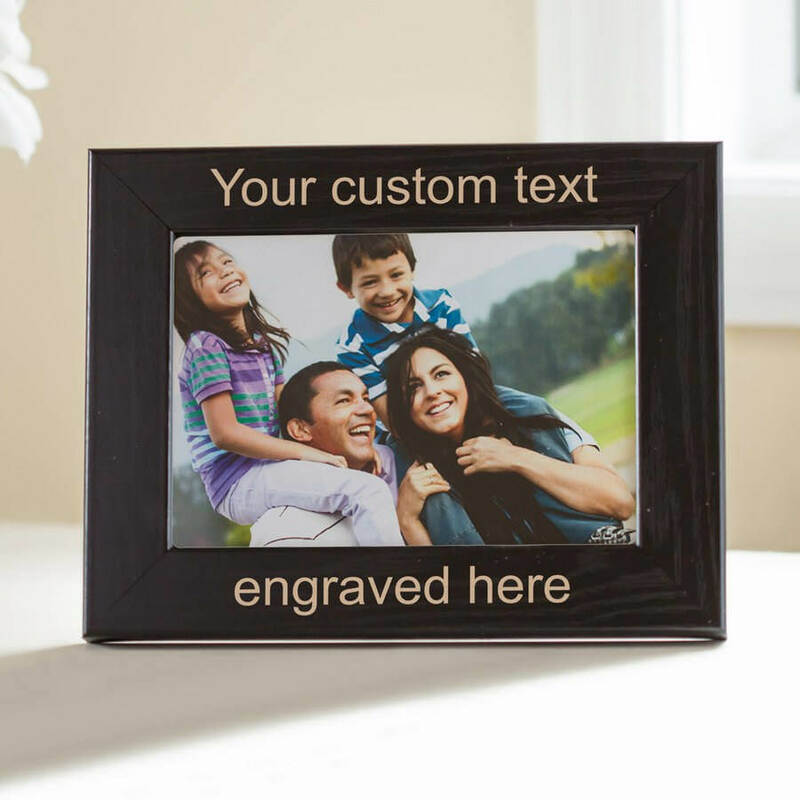 This frame ensures that your photo is the star of the display while still maintaining an interesting, personalized border. If you are looking for a frame that can easily fit into any home, then this slightly rugged gray frame is a winning choice. Gray effortlessly matches any interior theme, either accentuating black and white photos or bringing bright colors to life. The sweet saying paired with an adorable photo will surely melt any nana’s heart. 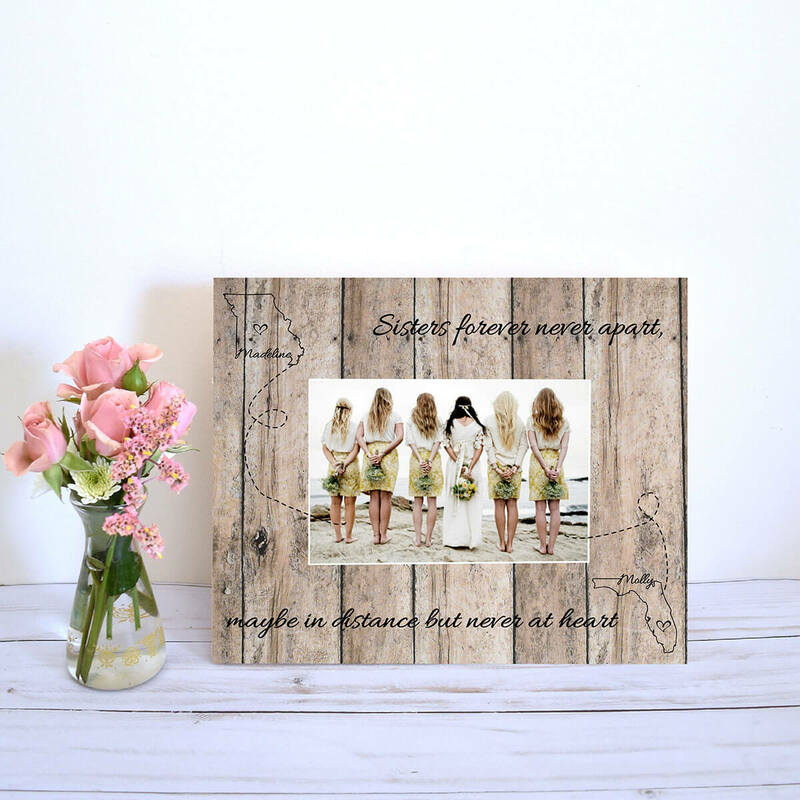 This adorable rustic wooden frame does just the right job of capturing those special moments with your sisters or friends who don’t live nearby. With the cute representation of states and the sweet engraved saying, this frame will remind you of your loved one and serve as a visual reminder that physical distance can’t keep you and your dearest ones apart in spirit. Sometimes just choosing a photo to print and frame can be the most difficult part of the process. For those who are stumped as to what precious photo to display, consider this photo-heavy alternative. 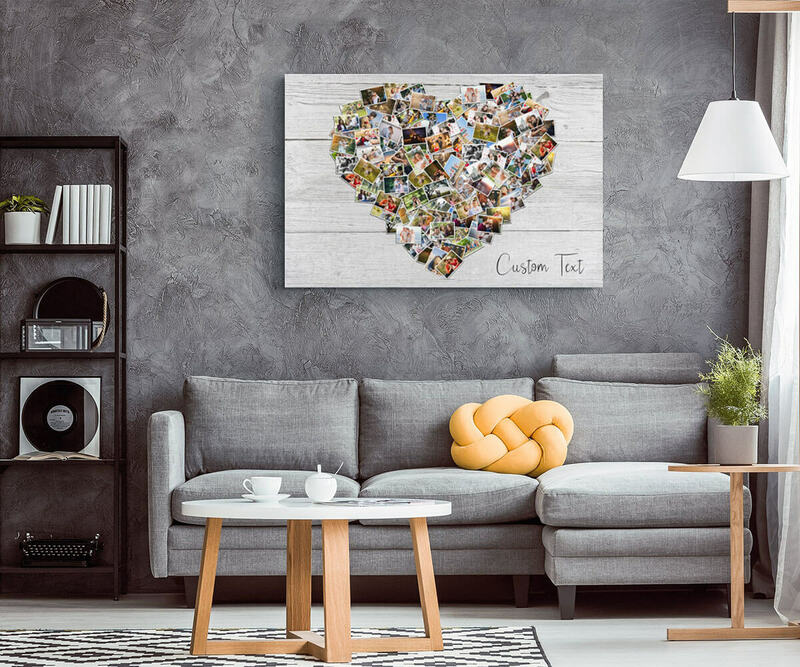 This lovely way to display all your favorite photos at once is a chic option for those times when you can’t just choose one – and haven’t we all been there before? 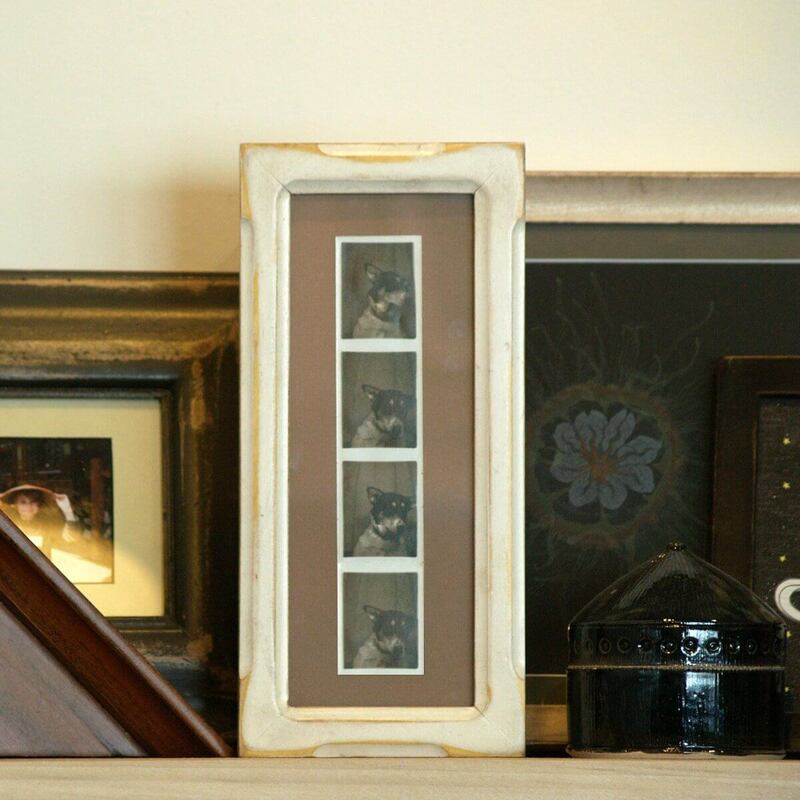 Oftentimes, when displaying a favorite photo, it is a good idea to go simple with the frame. 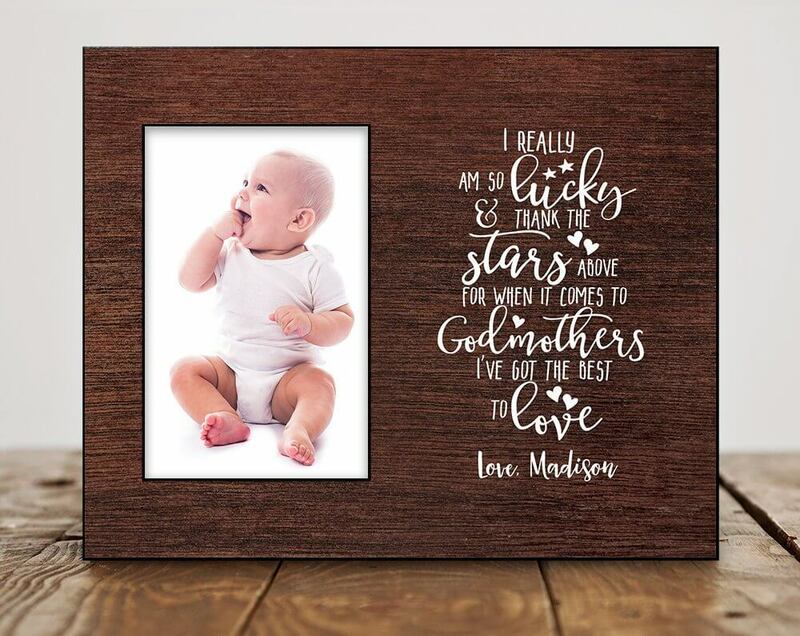 This is a classic solid frame that works great for any standard-sized photo while also offering the option to add a personalized touch with large print engravings. Make this frame your own by picking a favorite family quote or memory. 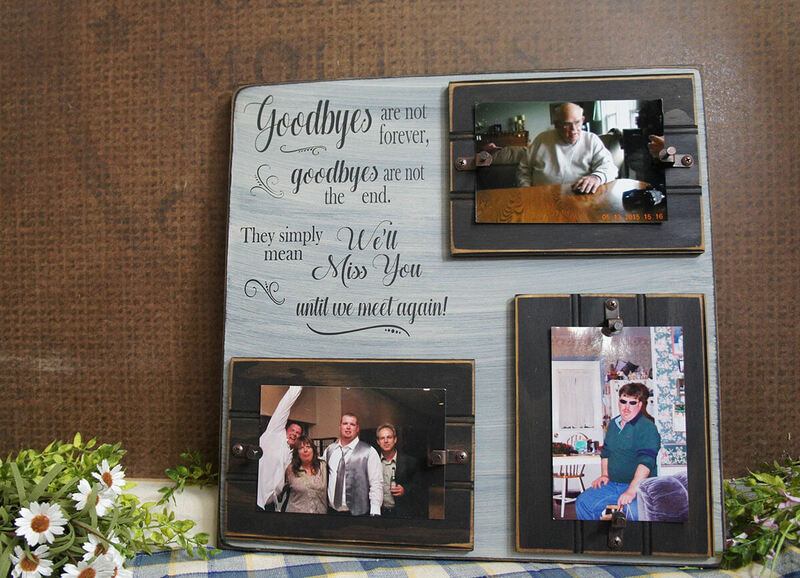 A lovely and thoughtful addition to any memorial service is a display of some favorite photos of the loved one. This square board offers slots for your three favorite memories and also includes a thoughtful, hopeful poetic verse. With many color and design options, this piece is also highly customizable for any occasion or color scheme. Having a new baby is a thrilling experience, but it can be hard to keep all those dates, times, and measurements straight. 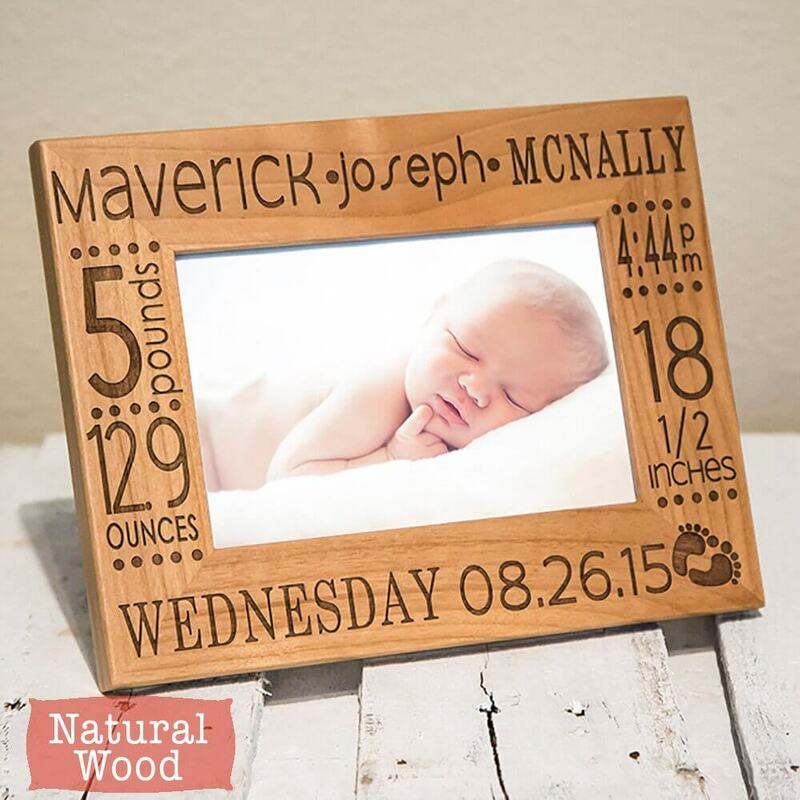 This picture frame allows you to not only display your favorite photo of your little darling but also access your favorite birthday tidbits and trivia about your newest addition. 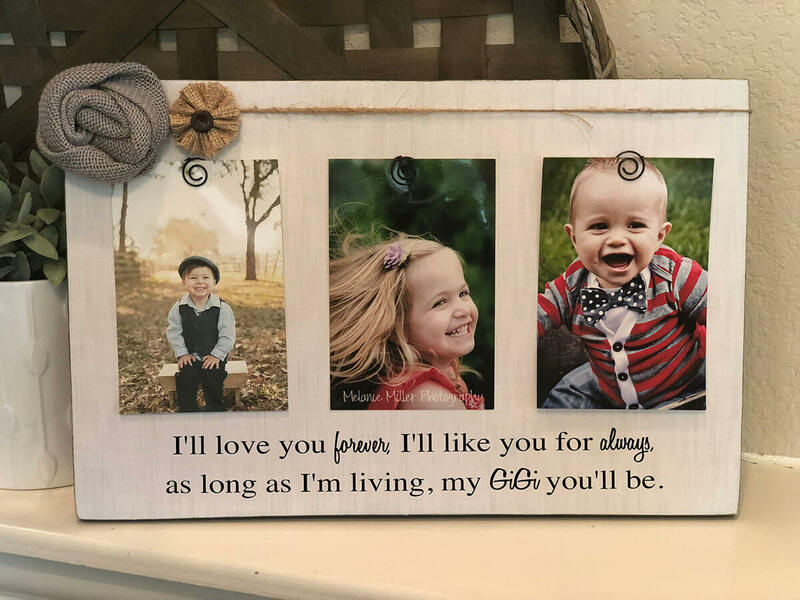 Perfect for any dresser or table, this freestanding tri-fold frame can display three of your favorite pictures side by side. 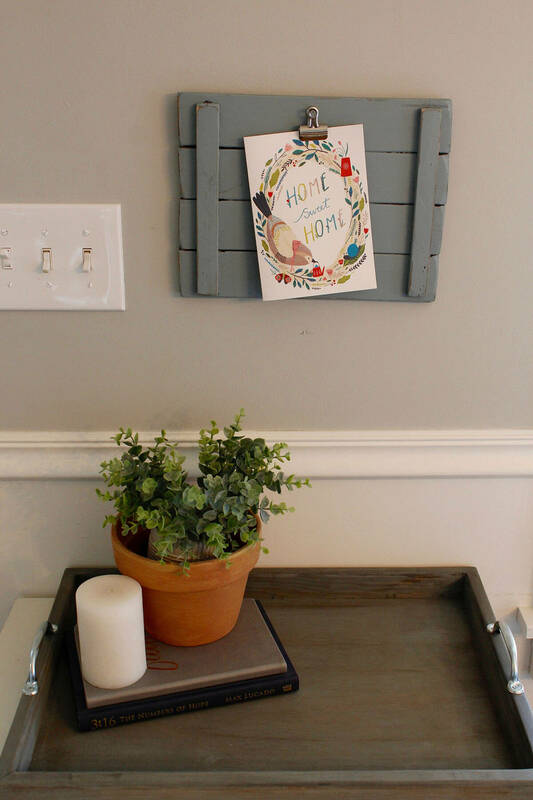 This foldable rustic frame comes in three different colors and two different sizes, making it an easy fit into your household décor. This frame’s ability to easily fold up is well-suited for spaces that change seasonally and makes storage a breeze. Who can resist popping into a photo booth when the opportunity arises? The only problem is then finding a suitable frame. That is exactly where this 4×10 frame comes in. The perfect fit for a single strip of photos, this display comes in a variety of colors and styles to match any home or office décor. 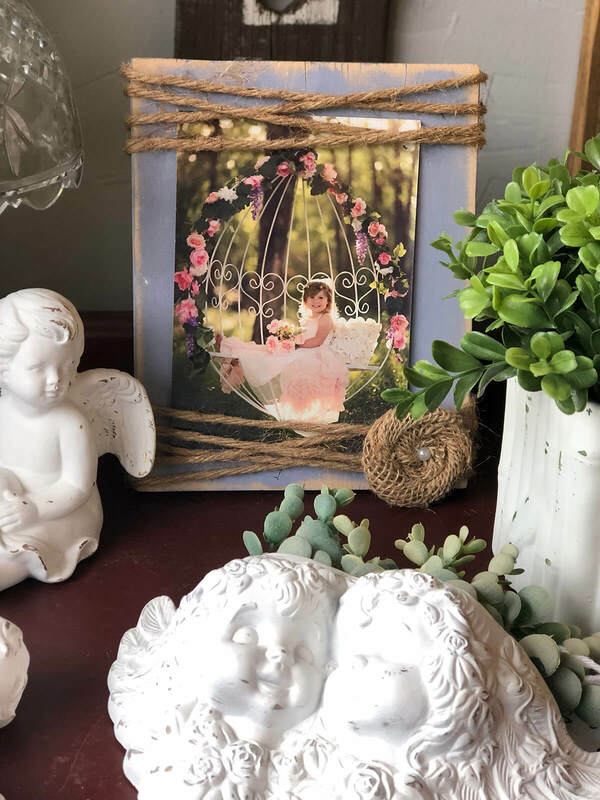 Whether you have a lovely shot from your wedding or a whimsical photo of your child, this cute and soft frame is a wonderful option for displaying a beloved photo. Pairing nicely with earthy colors, the burlap twine works not only as a photo holder but also as a natural accent to any greenery within your picture. Picture frames are a wonderful gift that captures precious moments and keeps them forever in our hearts and in our sight. This sweet option reminds daddy of a precious moment and is signed with love from a darling daughter. 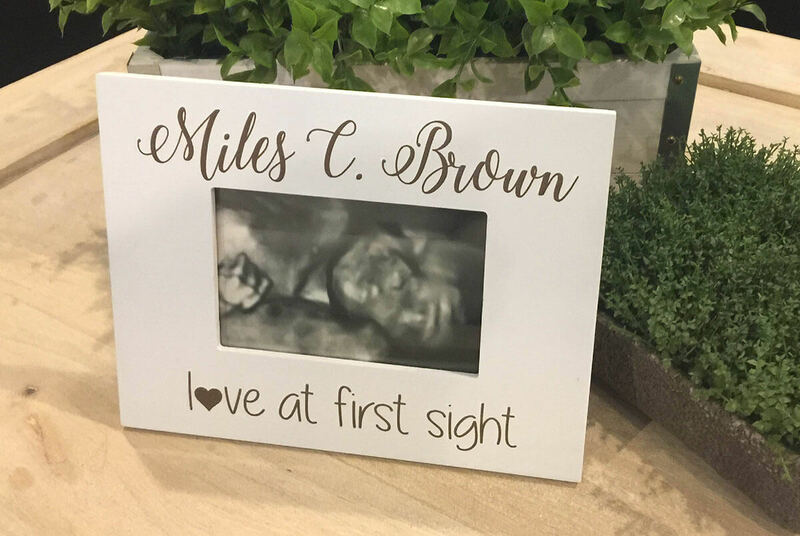 This frame makes an adorable gift for the loving daddy in your life to keep or change out his favorite photos over the years. A special relationship that goes beyond other kinds of friendship is roommates. Roommates share life in a unique way and almost always create special memories that, hopefully, are occasionally captured on film. 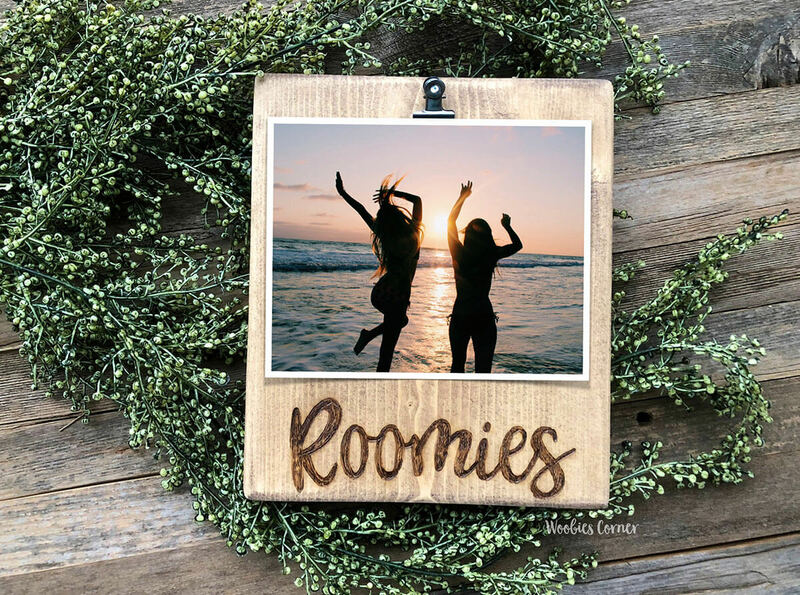 Display such a memory with this small and cute “Roomies” clip-on photo board to always remember the good times you’ve had together. 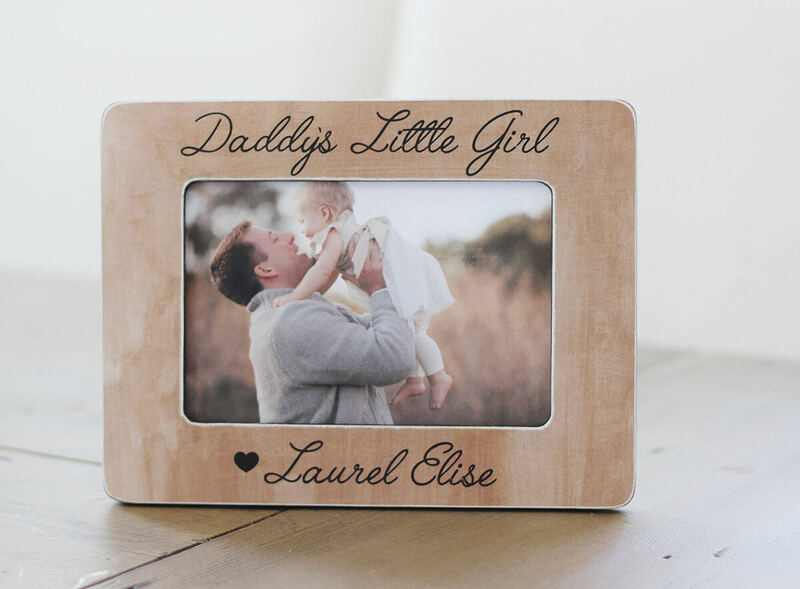 Picture frames that also include a short verse are a great two-in-one combo gift. Not only are you giving the recipient a thoughtful and pretty poem, but you are also including a super sweet photo that they can see every day and cherish. The bright white coloring against the gorgeous dark grain makes the text stand out. With an almost handmade touch, this adorable frame offers a simple note on a minimalistic frame with a very sweet burlap bow accent. 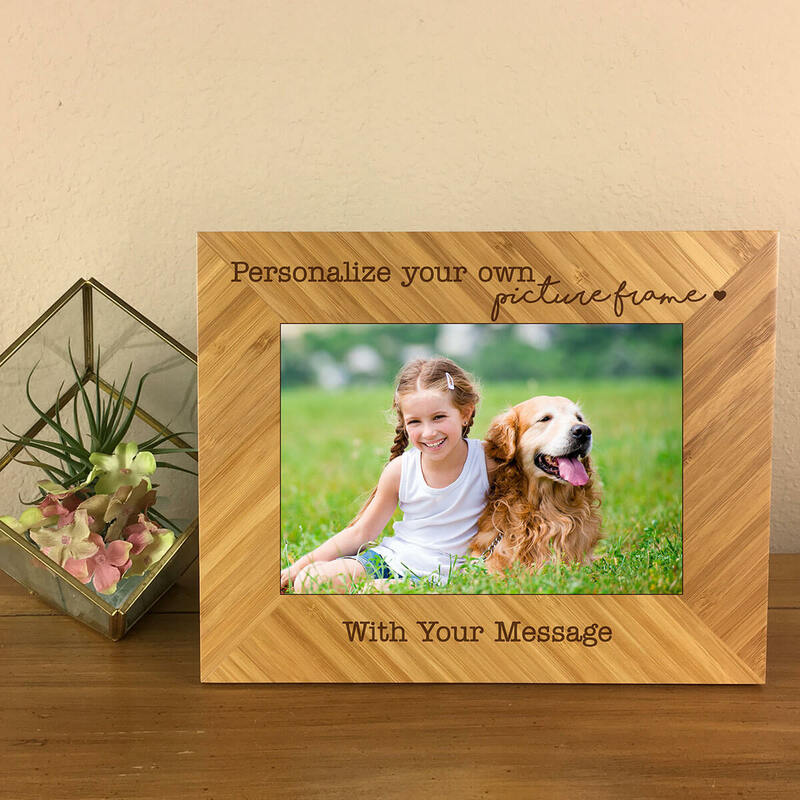 Displaying the square photo inside a square frame creates a cohesive look and that can easily match with other frames or pieces of wall art in your home or on your desk. Farmhouse chic is a growing trend in many homes and kitchens. 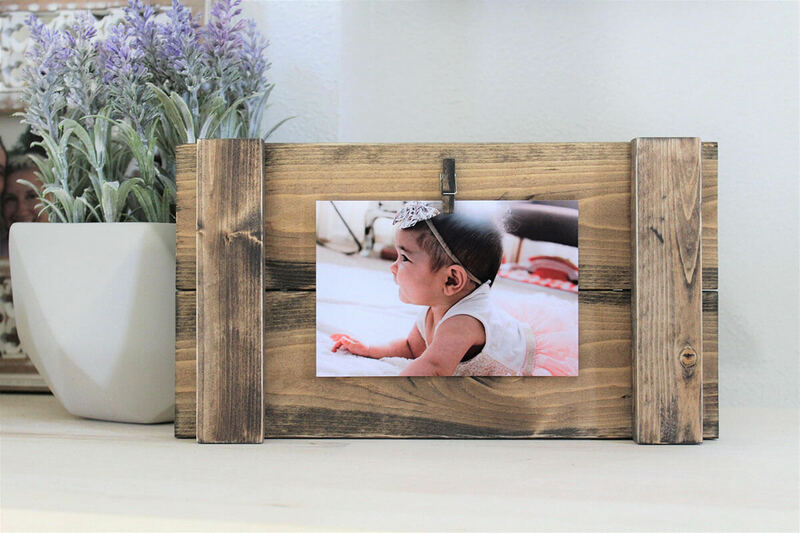 If you have adopted this look or want to try it out, this small, vintage, pallet-style clipped photo display is a lovely choice. Utilizing a large alligator-style clip, this look nods to the practical while maintaining a level of rustic sophistication. 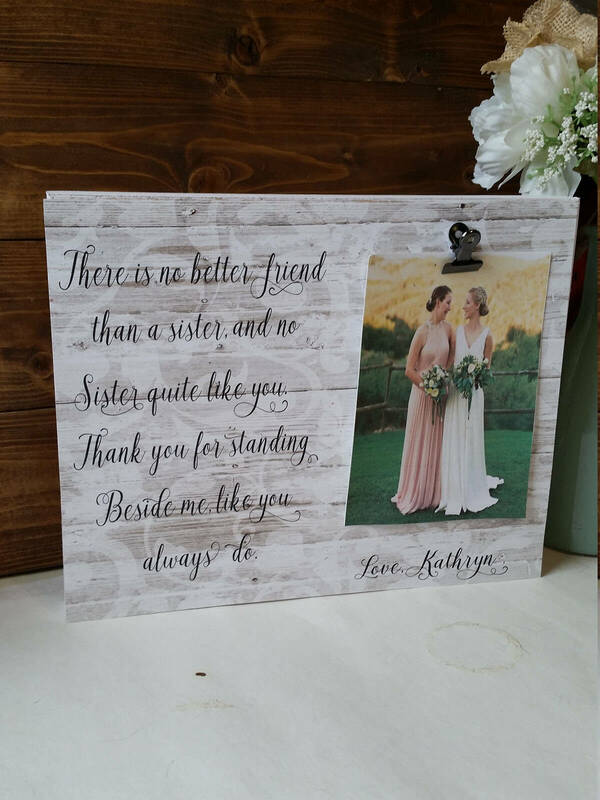 An excellent choice for display at home or a wedding, this painted and stamped wooden frame serves as a tribute to a beloved sister. To add to the sweetness of your sisterly photo, a short and charming poem accompanies the image on the side. Available in six different rustic chic-inspired designs, you are sure to find a coloring that fits your event or décor. 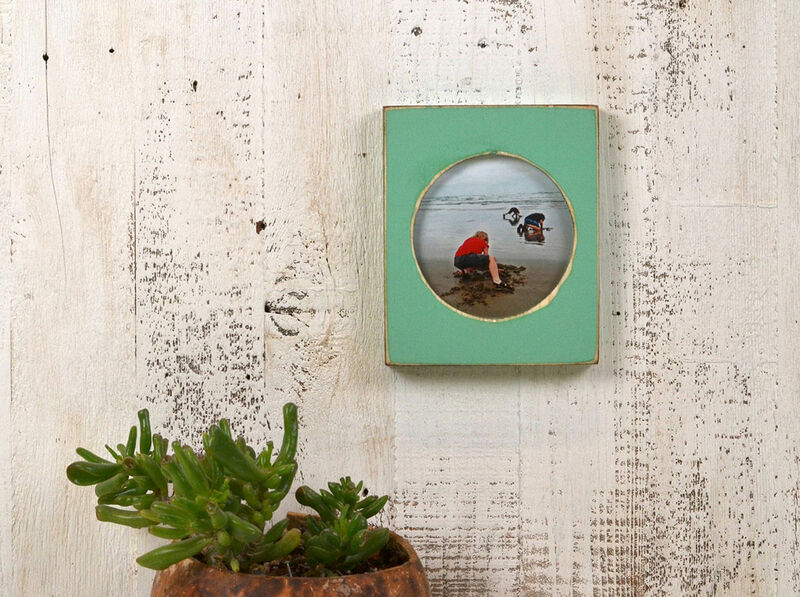 Playing off of the mid-century modern look, this square frame with a round photo display is striking in its simplicity. With color choices ranging from wine to Roman gold to robin’s egg, there is surely an option for you. Be sure to consider the photo you would like to display before ordering your frame to ensure a perfect color match. With pictures springing up from this adorable display like gorgeous flowers, you might say that this frame is undergoing “photo” synthesis. 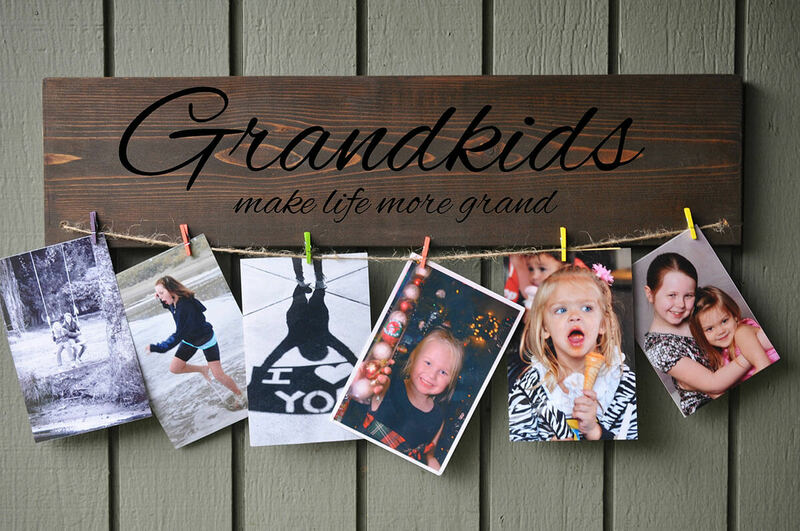 This adorable wooden sign with a burlap bow is a great gift for any grandparent looking for ways to see their little-loved ones’ faces smiling up at them every day. When it comes to grandparents and photos, it is a classic case of the more the merrier. 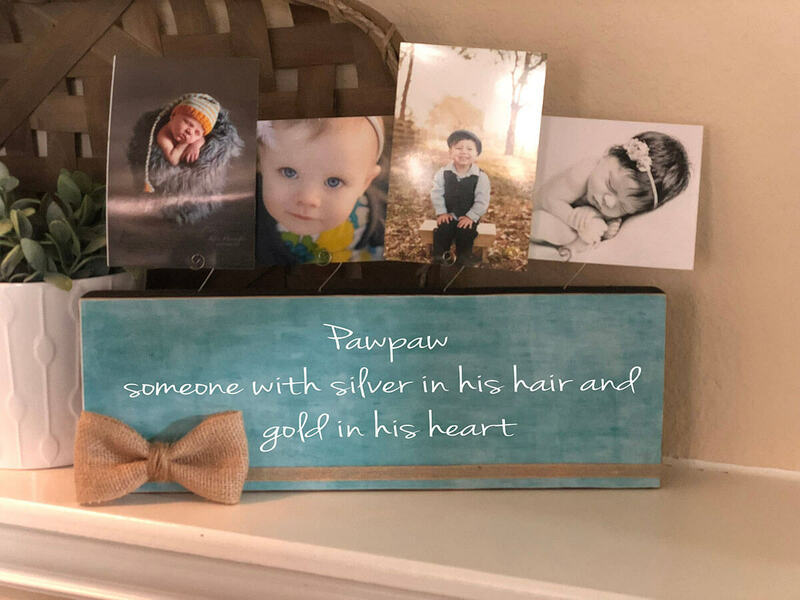 This hanging display is a great way to show off many favorite photos at once, and it makes for easy rotation of photos so that Grandma and Grandpa can keep things fresh and up to date. The clothesline look also gives this piece an element of vintage charm. 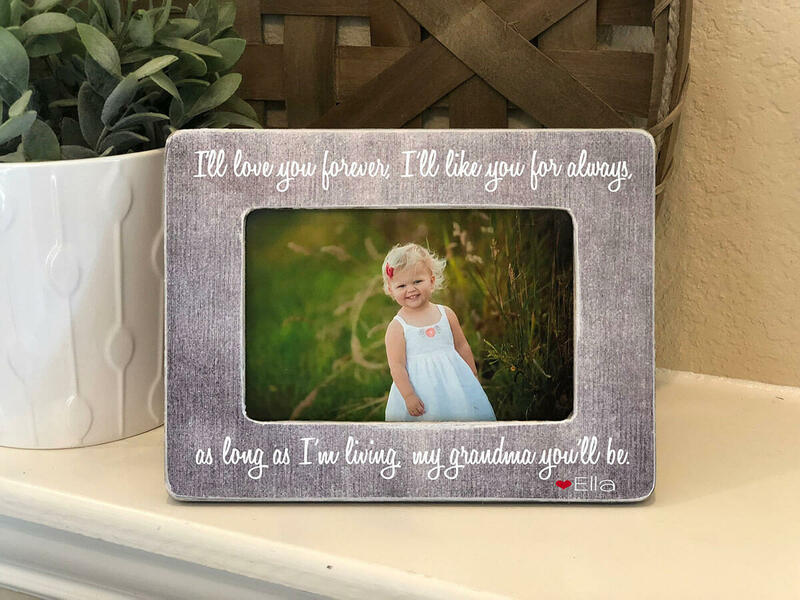 With sweet handcrafted fabric flowers, places for three favorite photos, and a sweet and sentimental note, this picture frame is sure to bring a smile to everyone’s face. Great for any chic grandma, this simple display highlights the photos and incorporates delicate additions here and there for a complete display. Chances are, your wedding officiant expected nothing in return for performing your ceremony, and yet without that person’s thoughtful words, your special day would not have been the same. 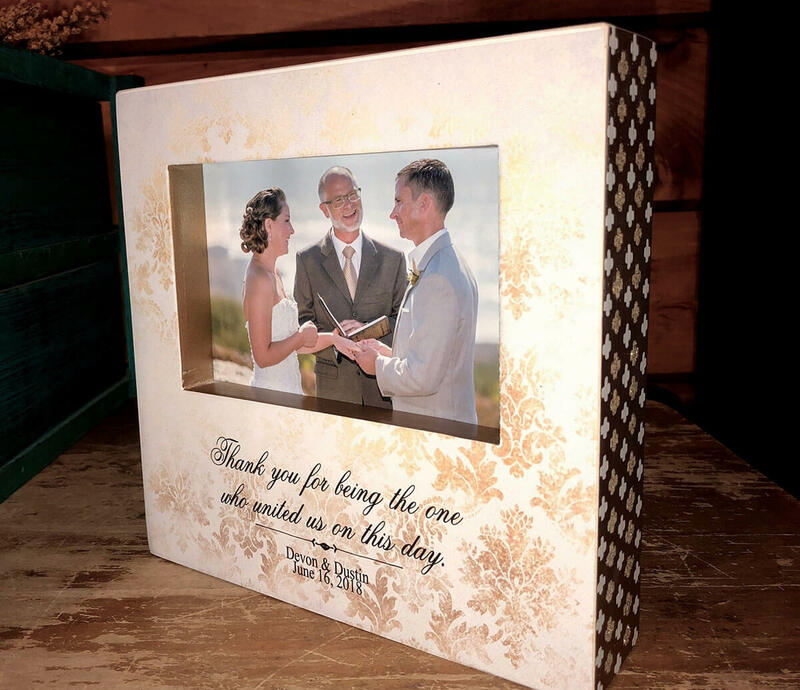 Give your officiant a heartwarming thank you gift with this handmade, recessed photo frame, capturing the special lifelong bond that the three of you will share. 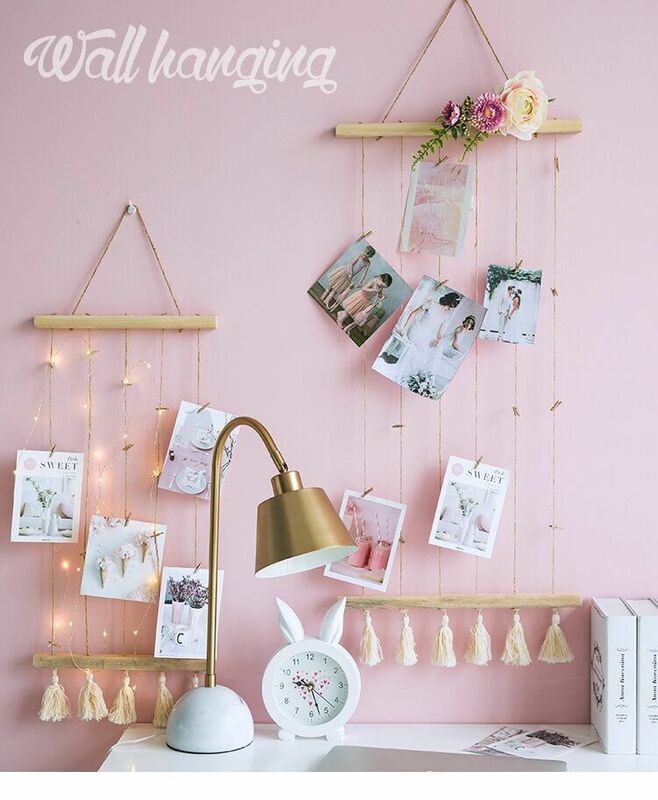 This playful display is great for a beloved childhood photo. 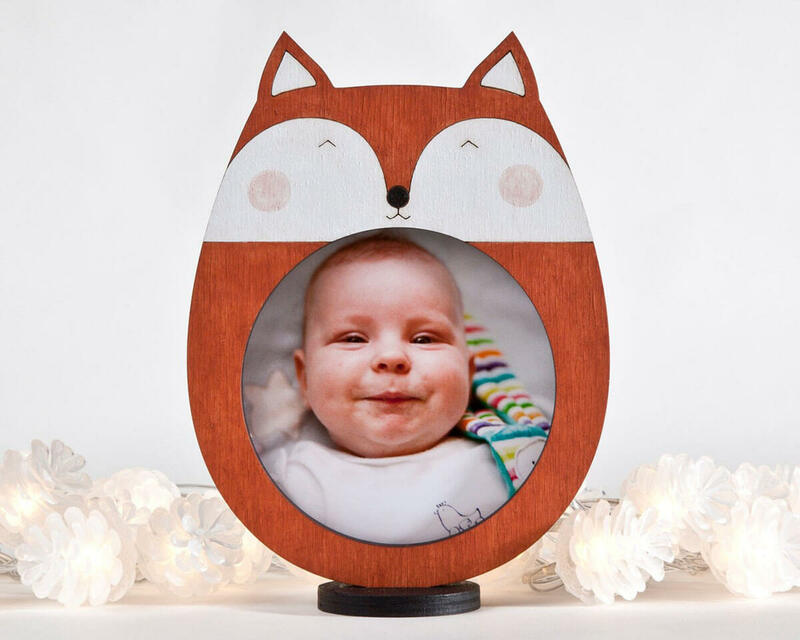 Whimsical and absolutely adorable, the sweet pink rosiness in your baby’s chubby little cheeks will match the warm hue on the round fox’s face. Give this as a gift to a grandparent, or keep for display in your child’s woodland creature-themed room. 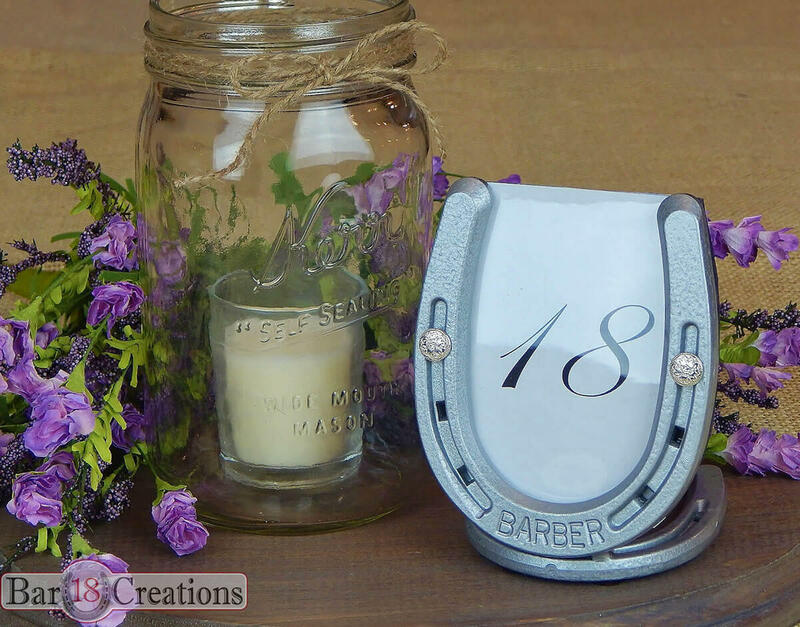 Everyone knows that a horseshoe is said to bring good luck, which makes this frame an apt choice for both the superstitious and the horse enthusiast. Use this frame as a centerpiece or to display your favorite riding photo, a picture of your beloved mare, or simply a fun outdoor shot. This sweet and petite reminder of that special day when she said yes is fantastic for the home or at the wedding. 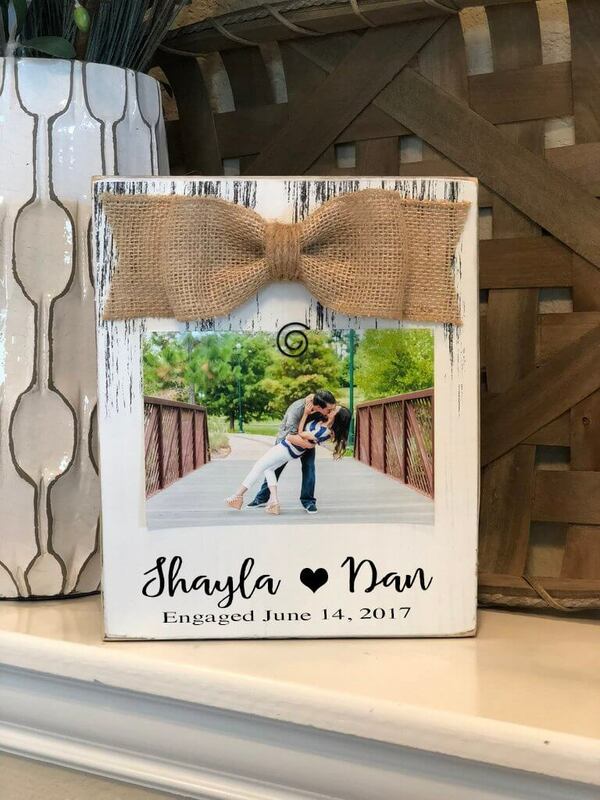 A large burlap bow adorns the top of the distressed white wood frame, while the memorable date is displayed under the happy couple’s names. A simple swirl hook allows you to rotate in all your favorites from your engagement photo shoot. If you are trying to create a cohesive photo-centric wall display, then these multi-layered naturally colored picture frames are an excellent choice. The warm and neutral color palette goes well with black and white prints but would also easily work for photos in sepia tones or those set in nature. Finding the right words can be so important when getting a gift for the mother of your spouse. You want to express to them how much both they and their son mean to you. That is why this wide frame is an amazing choice. It makes the focal point the mother-son relationship while clearly relating your love and gratitude. Small and simple frames are a splendid idea when you are trying to creating a larger scale display. These frames are practical yet eye-catching, being small and light enough to be clipped to this unique net display. When going with this look, be sure to select multiple colors to add contrast and variety. Festive and practical, these lights not only serve as luminous décor but can hold and brighten up some of your favorite photos. 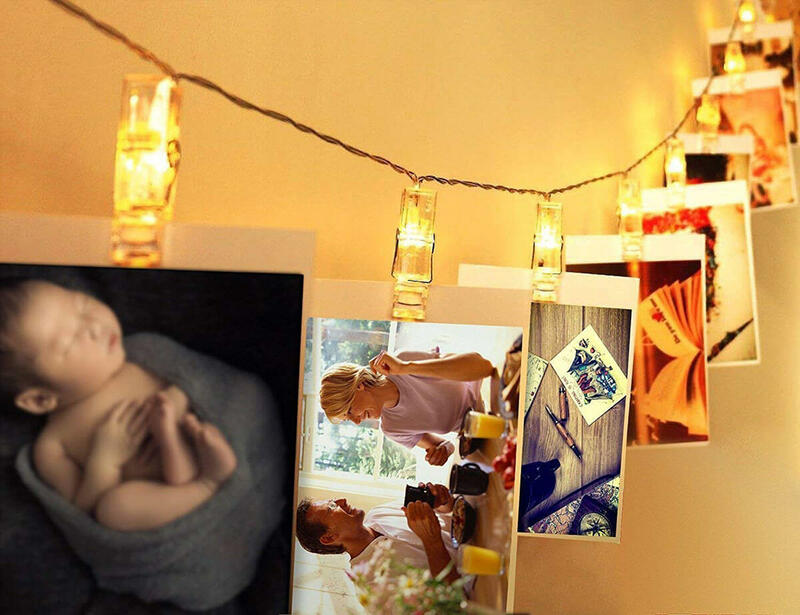 Use this display around the holidays with your favorite festive photos or Christmas cards, or string it up any time of year to give a warm glow to your special captured moments. This whimsical wall hanger makes chic practical. With taut twine to clip your favorite pics to, you can then accent this piece to suit your fancy. Add flowers, lights, cards, or other elements for a personalized touch. 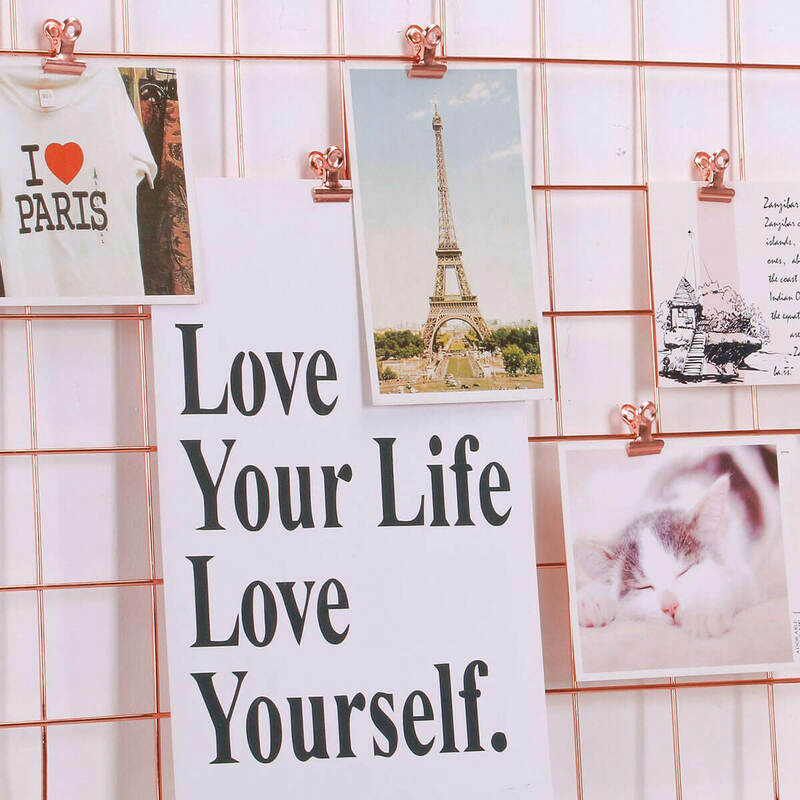 Great for any bedroom or office, this creative photo display is on point. Flawlessly bending hard and soft with rose-colored metalwork, this update to the classic bulletin board will mesh well in any dorm room, bedroom, or office space. With the freedom to clip on wherever you choose, you can select photos or prints of varying size and shape without having to worry about whether they will fit in. The simplicity of these paper frames is their greatest strength. Coming in a variety of colors, these borders function solely to assist in the tidy display of the photos. 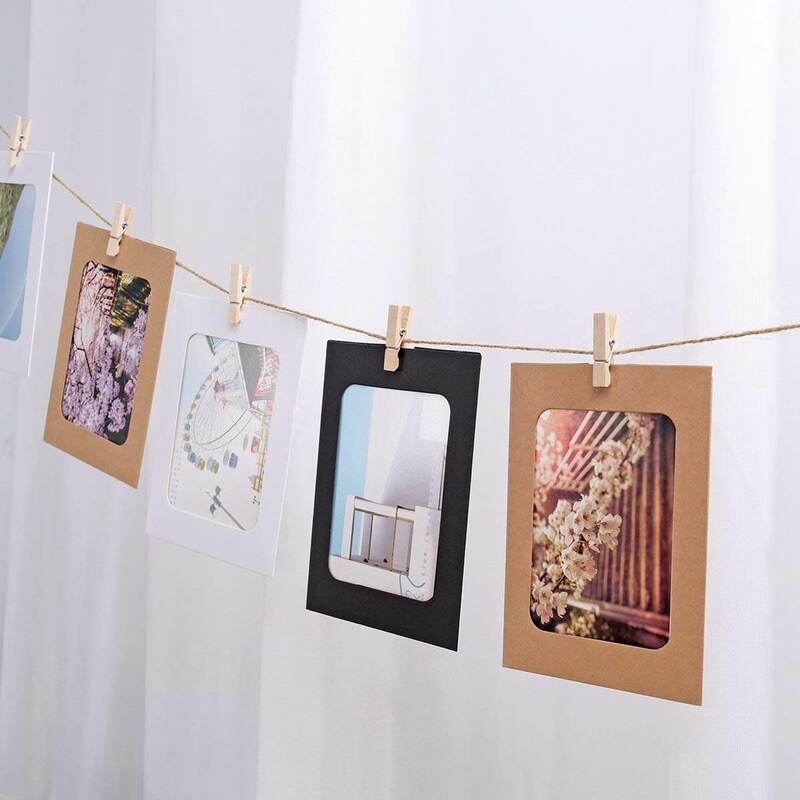 Use this idea for photos displayed at a party or wedding, or keep these clothes line up all year and rotate out your favorite pics with the changing seasons. The best way to elevate wood to look expensive and sophisticated is to choose a dark stain. 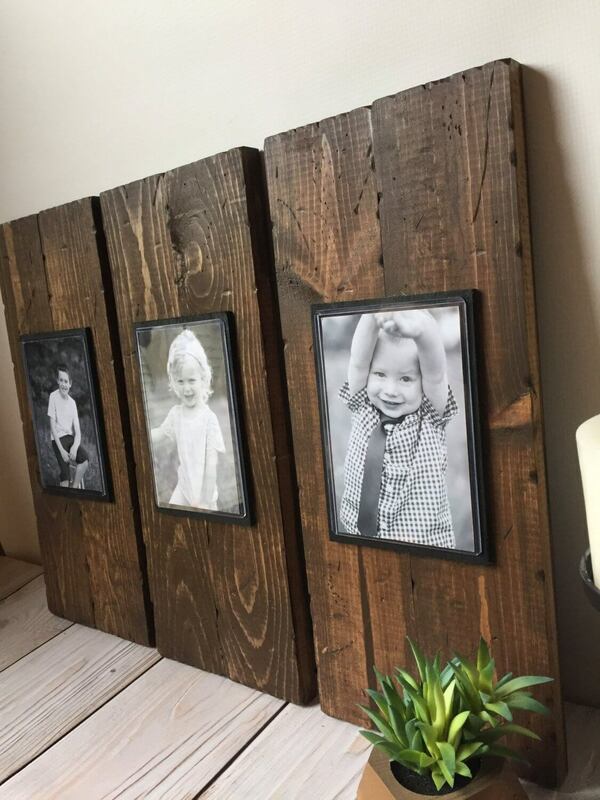 These simple black frames holding your favorite black and white shots are taken to the next level when mounted to these well-treated boards, combining to make an overall cohesive and classy display. 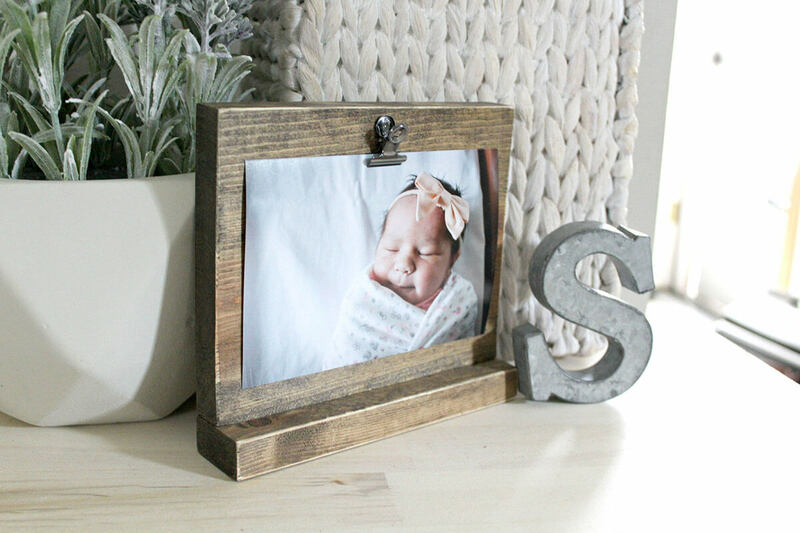 This petite farmhouse chic frame is exactly right for displaying a photo of your favorite little one. 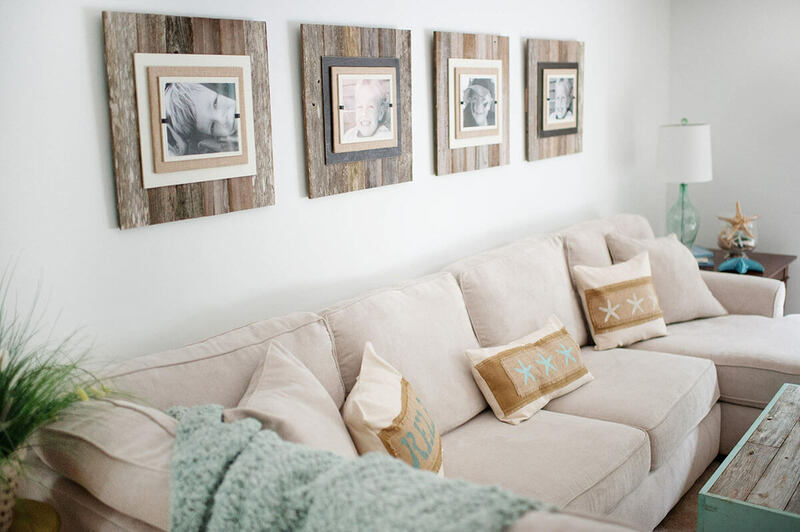 Just big enough to clip on a single favorite photo, this pallet-inspired frame can be set or hung anywhere with ease, making it a terrific choice for relatives who have limited wall space. Featuring a solid base for easy display, this single photo clip frame is a great choice for a tableside reminder of your favorite loved ones. Easy to bring along on a trip, this design will be especially appealing to travelers who want to have a reminder of home while on the road. 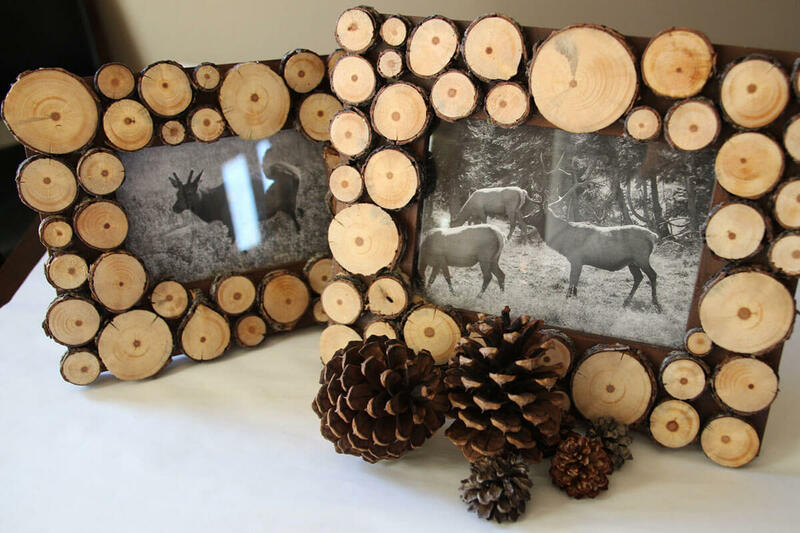 These handmade frames are created using beetle-kill wood pine and come in two different size options and can be used both vertically and horizontally. 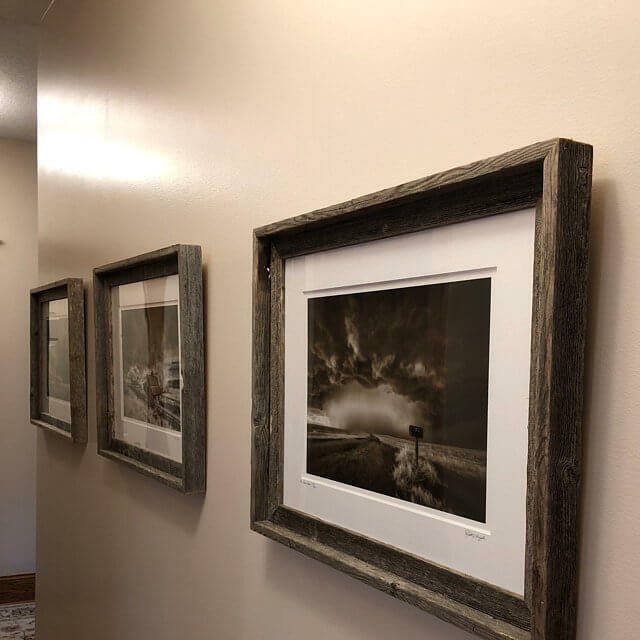 As you can see, the attention to detail and time put into these pieces pays off with one-of-a-kind frames for displaying your favorite nature-inspired photos. 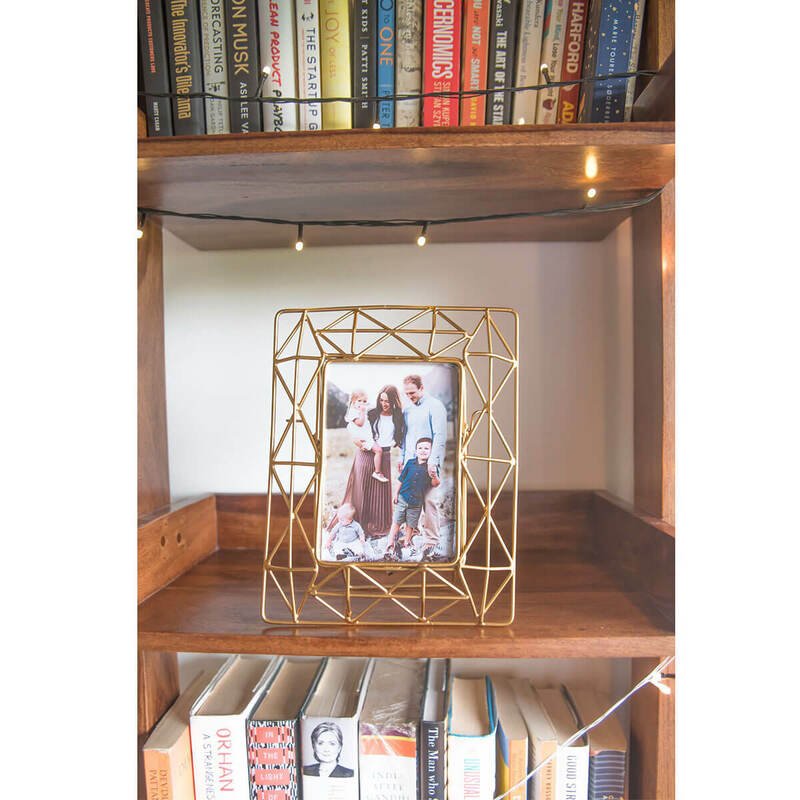 With its diamond patterned gold wiring, this picture frame has an elegantly simple design and does its job exquisitely by delicately yet solidly holding your favorite family photo in place. Appearing to almost hover, this frame takes the classic approach and adds an airy Art Deco spin that expresses space and gives the picture room to breathe. 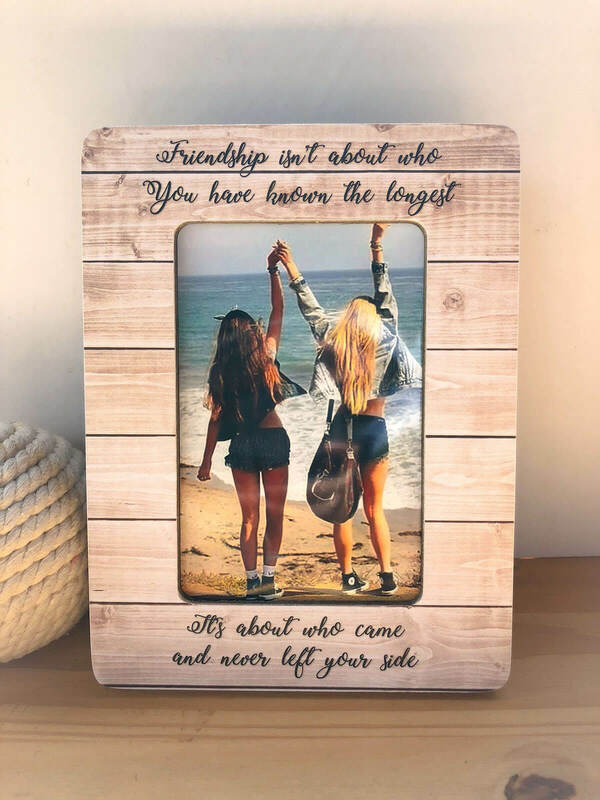 A good friend is always worth celebrating, and with this beachy frame, you can have a daily reminder of what your friendship is all about. Great as a gift, this frame is available in portrait or landscape. Dig up your favorite memory, choose a photo and complementing background that represents your unique friendship, and send this off to your bestie. 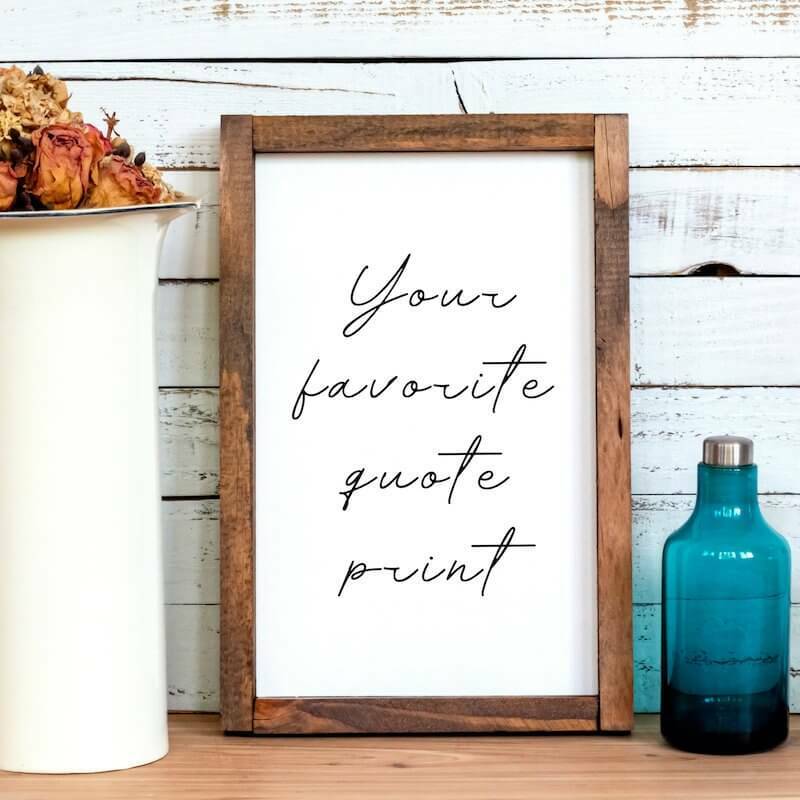 They say that a picture is worth a thousand words, but with this framed quote, your display is worth, well, however many words are in your favorite quote. 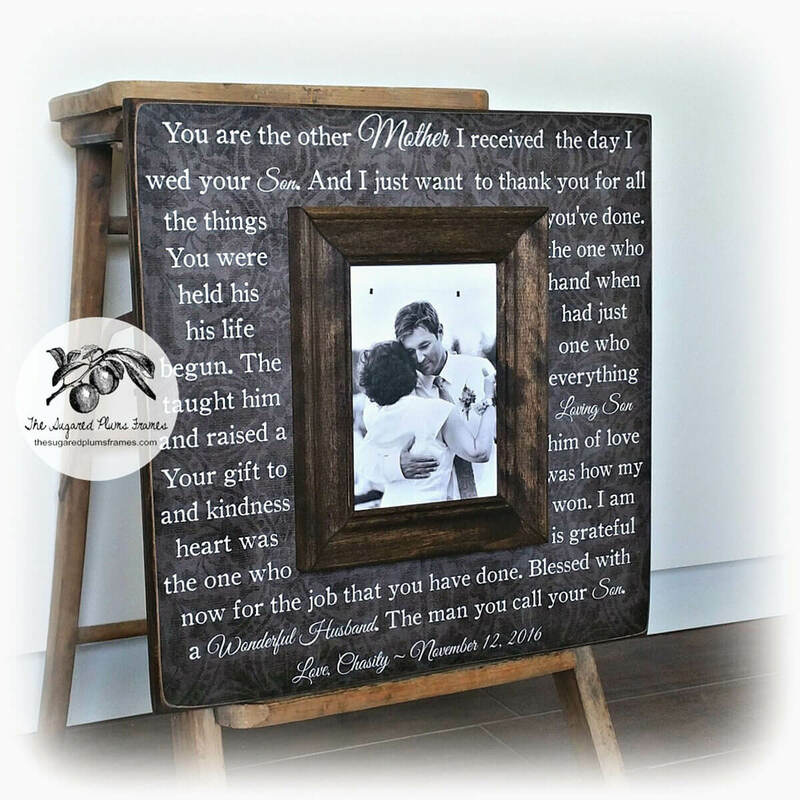 Nearly every detail of this design is customizable, so you can begin with the simple wooden frame and insert whatever quote, poem, logo, or photo that you see fit. Every photo captures a moment in time, but photo booth pictures are extra special because they also are an experience in and of themselves. 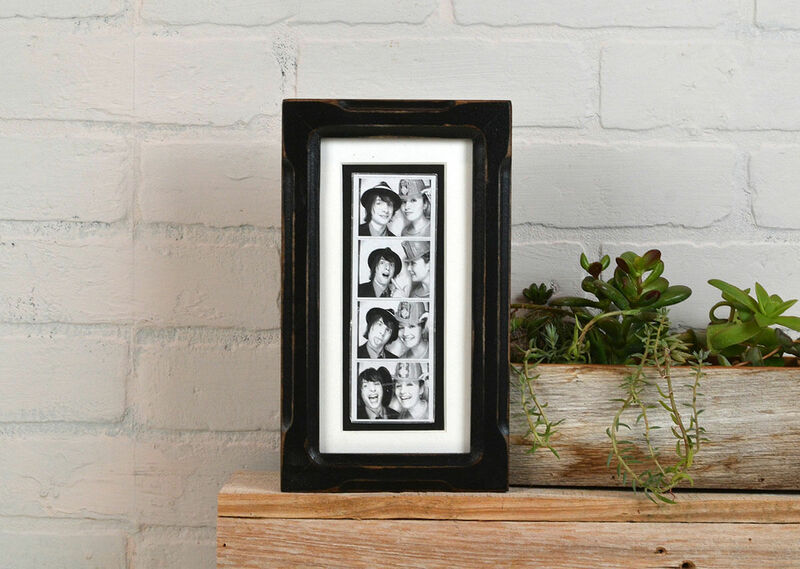 While squeezing into the booth and donning funny props may bring out your goofy side, this elegant black and white frame is simple and effective, giving the limelight to the fun that you and your loved ones had. 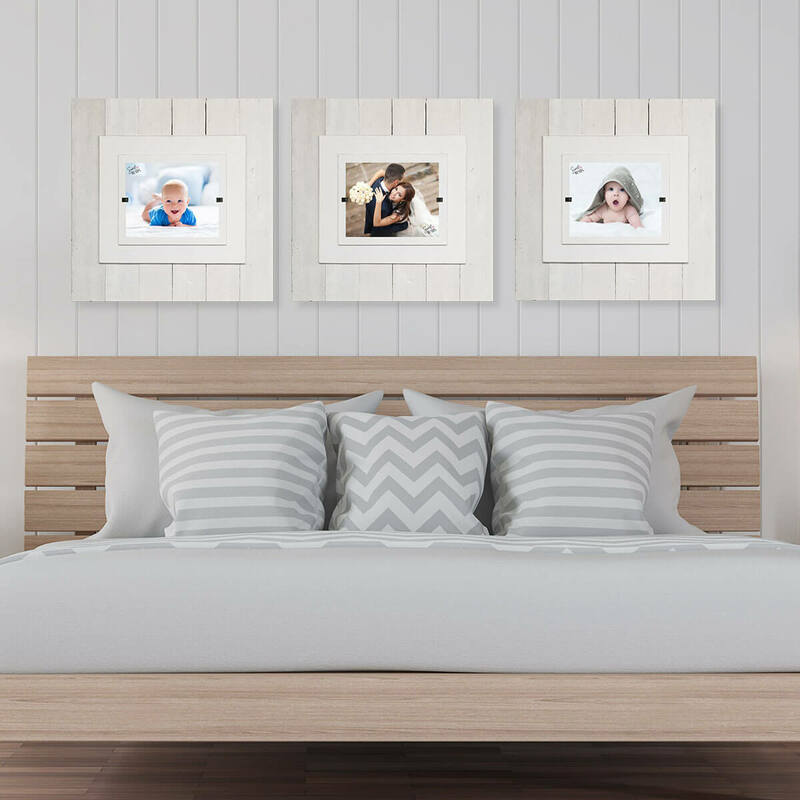 This set of frames uses recycled shiplap to achieve a clean, fresh-as-linen look to display your family’s best photographed moments. The straight vertical lines of the boards and the simple white finish make these frames a natural complement to a modern or beach-themed aesthetic. Also, if you are looking for an anniversary present, remember that wood is the traditional 5-year wedding anniversary gift. In an age of constant visual stimulation, hanging onto those images that are most dear to us is becoming increasingly important. Of course, snapping and choosing those stand-out photos is only half the battle; selecting the right frames to display them in is equally important. This list of 43 photo frame ideas will give you a fresh take on how a well-chosen frame can make a big impact in your home or office. 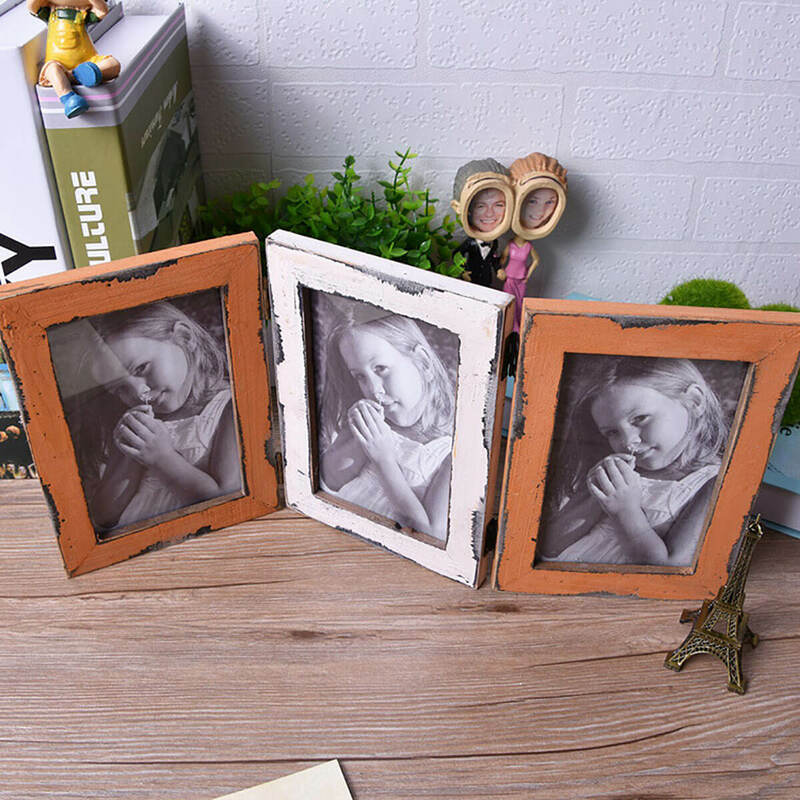 While they will always be less meaningful than the photos themselves, attractive photo frames can accentuate the colors, motion, and mood of your favorite photos to make a perfect monument to the past.